U.S. colleges and universities raised a record $40.31 billion last year, buoyed by megagifts to Stanford University, Harvard University and other wealthy institutions. The 7.6% increase in charitable donations was fueled by more gifts from individuals, rather than from foundations, and benefited from soaring valuations of gifts of art, according to an annual survey set to be released Wednesday by the nonprofit Council for Aid to Education. Stanford led the pack with a record $1.63 billion raised in its fiscal year ended Aug. 31, followed by Harvard, which brought in $1.05 billion in its fiscal year ended June 30. Stanford’s haul included the donation of a major post-World War II art collection, valued at more than $600 million and announced in 2011. The new money pouring into higher education continues to be concentrated at just a handful of schools, further stretching a gap between institutions that can afford to offer free tuition for upper-middle-class students, such as Stanford, and those struggling to make payroll and considering mergers or even closure. The top 10 fundraising recipients accounted for 18% of gifts in the latest year, or $7.27 billion, up from 17.5% the preceding year and 16.1% a decade earlier, said Ann E. Kaplan, who directs the survey. 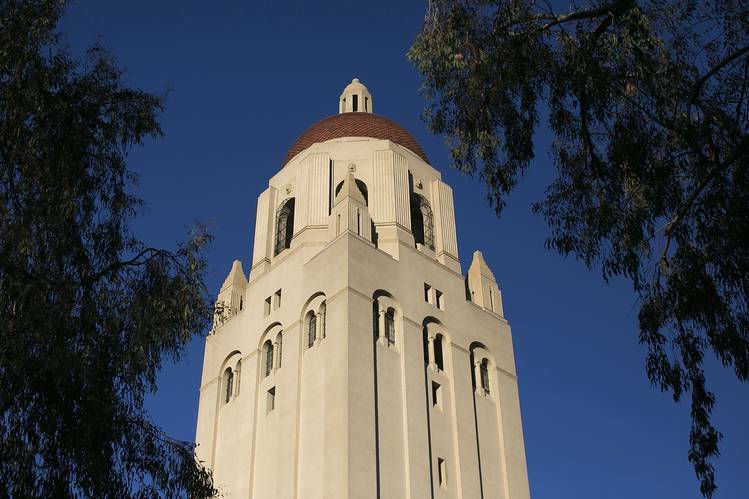 Hoover Tower at Stanford University. The richest schools are encouraging an arms race among donors as they seek funds to build sprawling health-care and academic complexes or to launch interdisciplinary programs. Successful alumni donors are eager to preserve their legacies by backing institutes that take on pressing challenges like global poverty and climate change. The survey didn’t address whether the donors were based in the U.S. or abroad. Eight gifts of $100 million or more were recorded in the latest year. 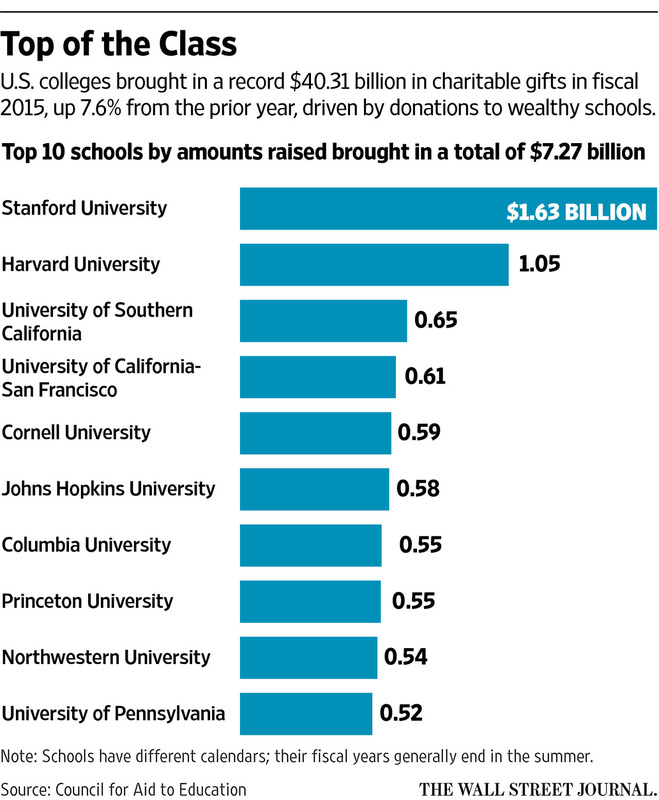 Valued at a combined $1.44 billion, the donations went to four schools. There were five such nine-figure gifts the prior year, totaling $698.6 million. Schools continue to welcome much smaller donations, too. Stanford said it received contributions from nearly 83,000 people; the majority of donations it got last year were less than $1,000, and nearly half of all donors gave $100 or less. “We spend a lot of time talking about how all gifts matter, about the power of collective giving,” said Martin Shell, vice president for development at Stanford. “That $50 gift, when combined with other $50 gifts, can make a fundamental difference.” He said such gifts can cover scholarships or faculty research grants, and noted that some million-dollar donors start with more modest donations. Ms. Kaplan predicted that charitable support for U.S. higher education would increase again this year, but at a more moderate pace. “It’s going to be tempered,” she said, citing weak stock-market performance at the end of the calendar year, a popular time for donations, and poor results so far in 2016, which will affect the value of any securities donated. “Even if people make the gifts they were planning to make, they will be worth less,” she said. Does the future have to be a digital future?